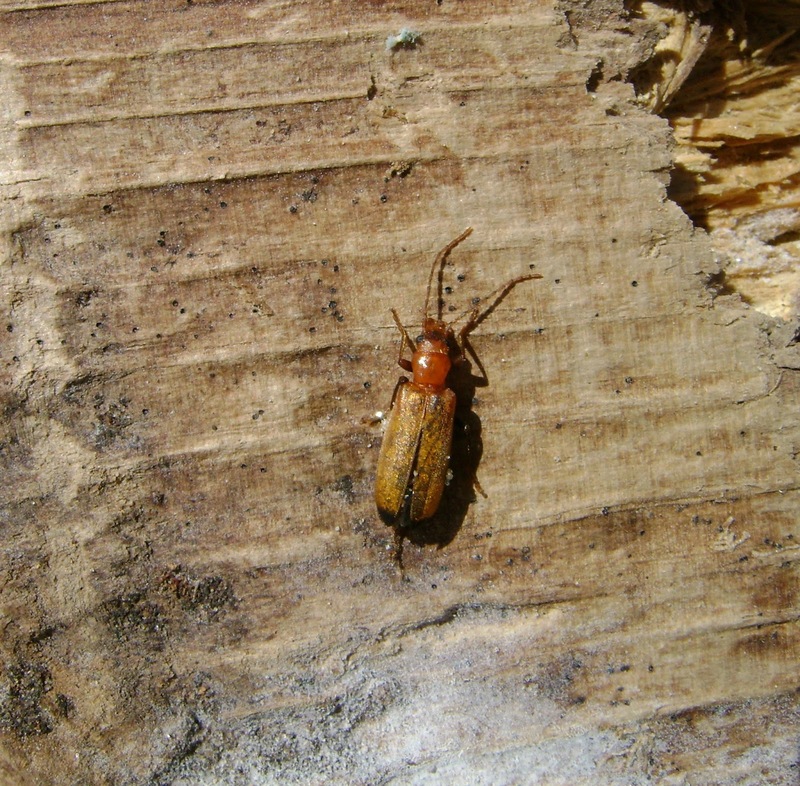 I received a phone call this morning from Barry Stewart, asking if I`d like to come with him to help survey the Tywyn Point area (the northernmost tip of Cefn Sidan sands at the RAF Bombing Range) for the rare carabid beetle Eurynebria complanata, an `old friend` from my beetling days. Barry was undertaking a survey on behalf of NRW and had previously surveyed other parts of Cefn Sidan as well as Laugharne-Pendine Sands (`MoD Pendine`) and Whiteford Burrows in NW Gower. 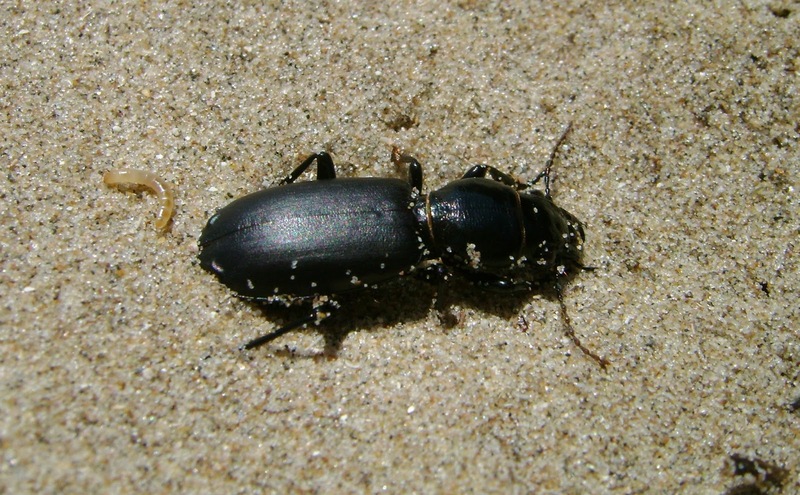 Alarmingly, Barry told me that this species - dubbed the `strandline beetle` is now confined to these three areas in the UK. 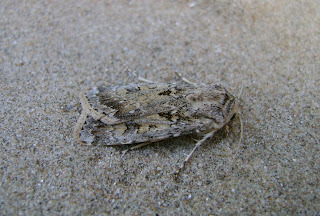 Obviously, I was keeping an eye open for moths too - but apart from the driftline not being optimum moth habitat, brief forays into adjacent terrestrial habitat were not productive, with a strong, gusty wind making use of sweeping techniques almost impossible. 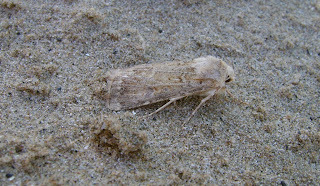 The only moth seen was a lost pyralid - Catopria pinella, looking incongruous in the marram grass. 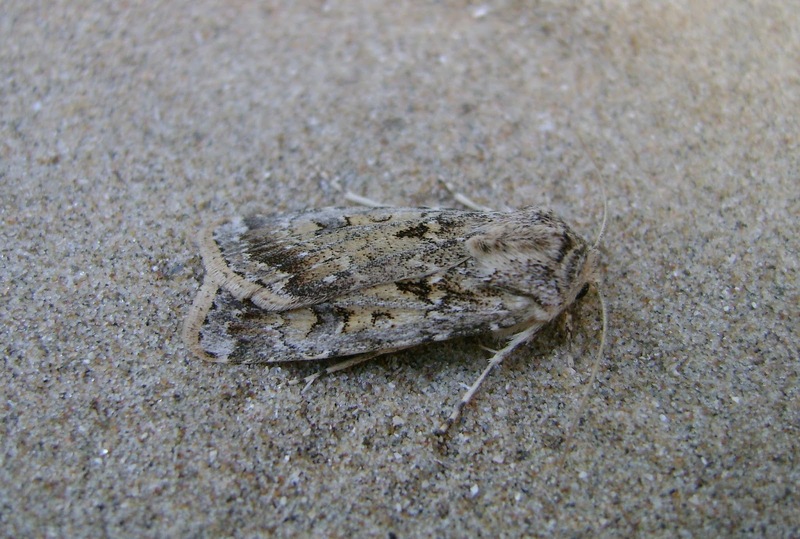 However, two sand darts were discovered lurking under plastic debris - the current collecting of such debris by well-meaning but misinformed volunteers is doing damage to a suite of specialised invertebrates, as well as hampering dune re-formation after erosion. Above: ...and the other one. 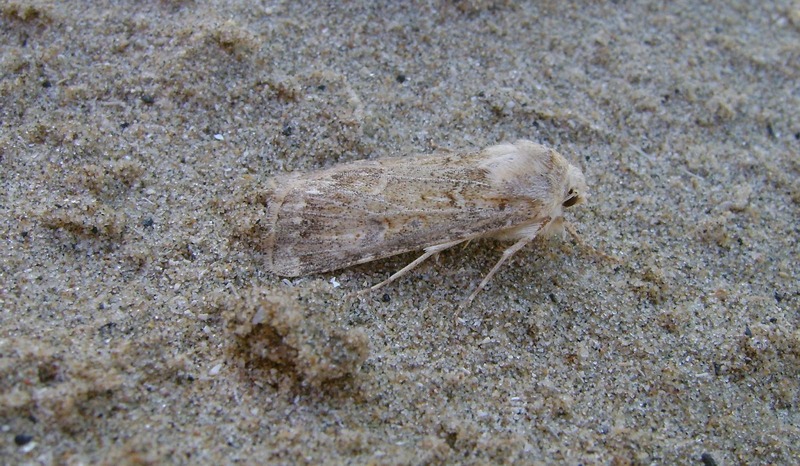 This heavily-marked individual made me consider that it may something else, but a quick, rushed check suggests it is a sand dart - correct me if I`m wrong please. Click on pics to enlarge. Above: Barry hard at work! Above: `forgive the beetle no 1`- Broscus cephalotes a frequently-found carabid under beach debris. Above: `forgive the beetle no 2` - the soldier beetle look-alike - Nacerdes melaneura, whose larvae bore into maritime woody debris. Above: I`m sure that you`ll forgive beetle no 3 - the object of our survey, the strandline beetle, Eurynebria complanata. This was just part of an aggregation of at least 72 individuals (representing a sizeable proprtion of the UK population) found under a plastic container at Tywyn Point. All our other counts were of much smaller numbers (typically 1-5) . 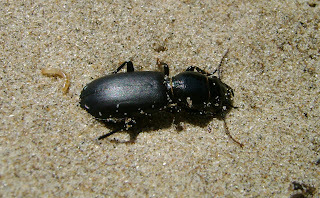 This beetle is threatened at Pembrey Burrows at the eastern end of Cefn Sidan by illegal wood collection and over-zealous beach cleaning. Finally, we had a very brief stop to look at a fen-grassland area near the Bombing Range entrance, but it seemed that the moths were sheltering deep in the vegetation, away from the strong wind. A silver hook was spotted, but the swaying twig upon which it perched was buffeted by the wind and off it flew before a photo could be taken. I recall having this moth nearby, 30 years ago in June 1986, on the very first Dyfed Invertebrate Group field meeting at this site. A good day I would say. The Strandline Beetle is brilliant - well done both of you!